Key Difference: Robbery is defined by the law as the criminal tries to take something of value from a person by force, intimidation and force. Burglary is defined as unlawful trespassing or forceful entry to commit theft in a private property. Burglaries are also sometimes known as breaking and entering or housebreaking. Robbery most commonly includes weapons, while burglary does not. Robbery also must include a victim, whereas burglary does not require one. Burglary and Robbery are both types of criminal activities, but they differ in nature. Though a lot of people confuse both terms, there are significant differences between the two, include punishment that is given for performing the activities. 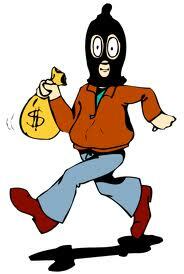 Both, robbery and burglary include property crimes and theft, where theft of property from an individual is involved. Robbery is defined by the law as the criminal tries to take something of value from a person by force, intimidation and force. For this to happen, a victim must be involved. If a person is not involved it cannot count as a robbery. Robberies can include single victim or multiple victims, such as in bank robberies. Robbery most commonly includes weapons such as guns, knives, etc. The word rob is derived of Germanic origin, from Common Germanic “raub” meaning "theft". Burglary is defined as unlawful trespassing or forceful entry to commit theft in a private property. Burglaries are also sometimes known as breaking and entering or housebreaking. In order for a burglary to happen a victim does not have to present. A burglary usually happens at a person’s home, or a bank (after it is closed), personal offices, business places, etc. A person can be charged with burglary if they trespass a personal property, even if the theft was not actually committed. Burglaries do not include the use of weapons, but may use lock picking kits or items for forceful entry. The term burglary originates from Anglo-Saxon or Old English and one of the Germanic languages. 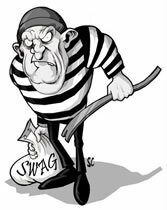 The word burglar is derived from “berg” meaning “house” and “laron” meaning “theif”.